Zookeeper Theodora 'Teddy' Bentley takes Alejandro, the Gunn Zoo llama, to a Monterey Bay area Renaissance Faire. Soon after, Teddy stumbles upon the still-warm body of the Reverend Victor Emerson, owner of the local wedding chapel. He is dressed in his royal robes as Henry VIII. At first it appears as if Alejandro stomped the man to death, but a closer look reveals a crossbow dart in the man's back. Teddy's investigation proves the "reverend" is really an escaped convict, and every marriage he's performed in the past twenty years is null and void. He twice married Teddy's ex-beauty queen mother Caro to wealthy men, and when both marriages failed, Caro received large financial settlements. Now she may have to give all that money back. But Caro wasn't the only person with a grievance against Victor. The child of the man Victor once murdered may have wanted to kill him, too. Then Teddy's embezzling father flies in from exile in Costa Rica to help spring Caro from jail, putting his own freedom in jeopardy. Can Teddy solve this case before someone else she knows is implicated? As a journalist, Betty Webb interviewed U.S. presidents, astronauts who walked on the moon, and Nobel Prize-winners, as well as the homeless, the dying, and polygamy runaways. The dark Lena Jones mysteries, based on stories she covered as a reporter, include "Desert Lost" ("One of the Top Five Mysteries of 2009, Library Journal), "Desert Noir" ("A mystery with a social conscience," Publishers Weekly) and "Desert Wives," ("Eye-popping," New York Times), and "Desert Wind," given a starred review by Publishers Weekly. 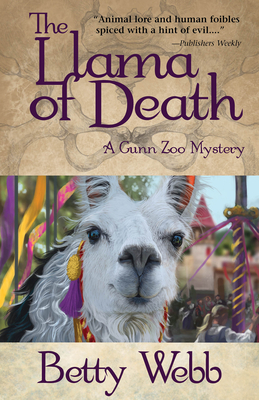 Betty's humorous Gunn Zoo series debuted with the critically-acclaimed "The Anteater of Death," followed by "The Koala of Death." A long-time book reviewer at Mystery Scene Magazine, Betty is a member of National Federation of Press Women, Mystery Writers of America, and the National Organization of Zoo Keepers.